Become a Certified Health and Wellness Coach. By taking this course, you will have completed 12 hours toward certification as a Certified Health and Wellness Coach. For information about becoming a Certified Health and Wellness Coach, click here. This course also provides 12 elective hours toward MentorCoach Certification. Do your clients start off motivated, but fall off the wellness wagon? In this class, we will be exploring the science of mindfulness, self-compassion, habits, exercise and sleep, as well as how to go deeper with clients using complementary mind/body strategies. Most people cite stress as a reason they fall off the wagon when trying to change. We think of stress as being something outside of us or something that is happening to us that is outside of our control. But technically stress is a mind-body response to a real or imagined threat and a feeling of being unable to cope with it. People with the highest perceived levels of stress develop the most chronic disease. Every client comes with stress. The stress response can occur simply by feeling overwhelmed with too many demands and responsibilities. We all develop bad habits and patterns at times that help us deal with stress temporarily, but can be tough to break. What is needed is to develop an inner trust in ourselves so that we can become more aware, listen to the body and react to stress in a more positive way. Mind-body medicine is about positively influencing the mind to improve health and promote wellbeing. The health and vitality of the mind (your thoughts, beliefs and feelings) is extraordinarily important to the health and healing of the body. Without addressing the mind and the physiology of the body, it’s hard to get lifestyle and behavioral changes to stick. The promise of mind-body medicine is to free you from excessive negative thoughts and the related state of mindlessness, so that you can enjoy life in the moment. Mind-body practices are simply a means to a higher purpose – to access the deeper, kinder and more compassionate and loving person that is within all of us, but that isn’t always fully available due to the burden of the daily stressors of life. Learning and practicing mind/body techniques help our clients become more confident, optimistic and resilient. This class will help you develop a toolbox of cutting edge approaches to help clients become more aware and empowered, make healthier choices and sustain positive health behaviors. Learn advanced skills and strategies to use as a health and wellness coach. Develop a skillset of mind/body practices to use with self and clients. Learn advanced strategies for coaching weight loss. Learn to use Emotional Freedom Techniques (EFT) with self and clients. Learn strategies to help clients develop and maintain positive health habits. In-depth exploration of the latest research on mindfulness and mindful eating, self-compassion, positive psychology and social connections. 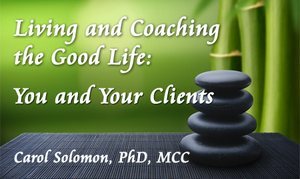 Develop a deeper understanding of the role of the wellness coach in using mind/body techniques. Become a model of wellness committed to continued self-exploration and self-development. Open to All The Becoming a Wellness Coach Master Class is open to all, both within the MentorCoach Community and without. This class provides twelve hours toward Certification as a Certified Wellness Coach for students meeting the attendance requirement (see #10 below). This class also provides twelve hours toward MentorCoach Certification as a Certified MentorCoach as an elective for students meeting the class attendance requirement. It can also provide 12 hours toward ICF Certification via an Accredited Coach Training Program such as MentorCoach or via the ICF Portfolio Approach. This class is also approved for 12 CCEs from the International Coach Federation for students meeting the class attendance requirement (see #10 below). There is no fee for ICF CCEs. To receive credit for CEs, students must pay the CE fee and be present for 6.5 of the 8 classes (see #10 below). However, to receive credit for CEs, ICF CCEUs, credit toward MentorCoach Certification, or to receive a Certificate of Completion, you must be present for 80% of the classes.